Commercially importing electronics into the USA is a hassle, but if managed successfully, can reap higher rewards than any other import! In 2016, the world spent over $2.5 trillion just on electronics alone, while the United States spent about $336 billion. The countless regulations and large margin for error is enough to discourage many importers from trying to import electronics, but the payouts are huge! Don’t let the opportunity get away from you just because it’s an imposing market. There’s money to be made! 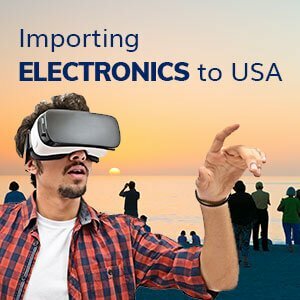 Here’s everything you need to know about being successful when importing electronics into the United States. When you hear the term “electronics,” images of cellphones or laptops might come to mind, but there are actually many different types of electronics that can be imported. Everyone thinks to import big consumer electronics, but all categories carry that high dollar value that’s so tempting to importers, so it’s important to be aware of your options. These 10 categories account for 70% of the whole electronics market, making them incredibly profitable business opportunities. Understanding the market is vital if you want to succeed. Take a look at which countries are contributing to the market, and what the individual import and export values are for each location. In order to start your import business, you need products to offer from overseas, which means you will need to find a supplier. Different suppliers offer different options for you, depending on whether you’re looking to import whole products, or electronic parts, or even raw materials. Using specialized online directories is the best place to start searching for potential suppliers. Websites like Alibaba and Bambify are streamlined, easy-to-navigate directories that make it easy to find a variety of different imports available around the world. There are even more exclusive or expensive online directories that are typically available for free at public libraries. Give your local library a call to see if they have that service available. Another option for finding a supplier is by using something called the North American Industry Classification System (NAICS) code. Just about every type of product that you could think of has a unique code attached to it, which can be determined on the U.S. Census Bureau website. Some suppliers list their products by the NAICS code, so if you know the code for your products, you can find a supplier that can provide you with exactly what you want. If you know of someone in the supply chain business, it would be a good idea to start networking with that person. Connections between people can often lead to finding the best supplier for your product, if you give it time. Even if the suppliers you encounter are not exactly what you’re looking for, they may know of someone who is, or at least be able to point you in the correct direction. If you don’t happen to have connections already, you could reach out to a company that works in the supply chain, like R+L Global Logistics. They can help you get the information you need and connect you with the right people. Once you have found a supplier that you want to utilize, an agreement has to be made about pricing. Some suppliers do not respond to every email because of the number of offhand buyers they have to deal with, so it is important to make sure your email is formal and concise when asking for a quote. Remember that electronics are expensive to produce and import, so try not to make your offer too cheap. Make sure to include everything that needs to be discussed right off the bat, to show the supplier that you are serious about importing their product. Include topics like what your maximum price point is, how many items you would want to import, what the production cost will likely be, and what the payment terms will be. Do not include superfluous details about the history of your company or your personal reason for importing a specific product. Assume that the person you are reaching out to is busy, and aim to not waste their time with things they don’t need to know. Once you have secured a contract with a supplier, it’s time to start thinking about how to get your electronic import into the United States. Several government agencies regulate the importation of electronic devices. It is important to be familiar with all agencies and requirements, to ensure that your import does not hit any snags on its way through the American port of entry. Although it is mostly the responsibility of the producer to ensure compliance, sometimes importers can get in trouble as well. Make sure you know that the products you are importing are compliant with safety regulations. Attempting to import products that are not compliant with the following regulations is illegal, and will result in your imports being confiscated and possibly destroyed. You may also encounter further legal repercussions. The U.S. Customs and Border Protection (CBP) is part of the Department of Homeland Security that regulates the import process, and it is the very first thing you need to consider when thinking about getting your product into the U.S. The CBP’s purpose is to prevent counterfeit, unsafe, or fraudulent goods from coming into the U.S., and stop illegal trafficking before it gets through the border. The first thing an importer will need is a bill of lading, which is a detailed receipt of the goods being shipped. An importer cannot file a Form 3461 entry with the CBP without first providing the agency with a bill of lading. All this must be done before the shipment of the goods. There are two main ways that a CBP entry can be categorized: an informal entry, and a formal entry. An informal entry is a shipment of goods worth under $2,500. A formal entry is an entry worth $2,500 or more. All formal entries require the addition of a customs bond, which ensures that the importer will pay back all dues and fees. It acts as a contract between the importer and the CBP. Since electronics are high-value, most, if not all, shipments of electronics will require a customs bond. There are two different kinds of customs bonds: single entry bonds and continuous bonds. Which one you choose to get will depend on your industry and how frequently you import goods into the U.S. Single Entry Bonds are used exactly how you would expect. They are for a single, low-cost, low-risk import through a specific port of entry, and a new one must be acquired for each new import you organize. The cost of a single entry bond is the total of any fees, taxes and duties. The minimum cost requirement for this type of bond is $100,000. Continuous Bonds are recommended if you intend to import more than 4 times in a year, or if your imports are high-cost or high-risk. These bonds will allow you to import as many times as you want, through any American Port of Entry, for an entire year. The cost of a continuous bond is 10% of taxes, duties and fees, paid out over the course of 12 months, with a minimum cost of $50,000. 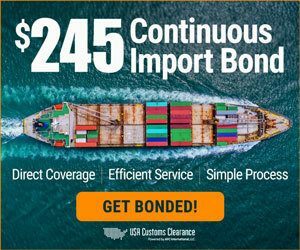 You can secure a customs bond for multiple or single entry bond through USA Customs Clearance if you’re looking to commercially import electronics into the United States. Or, you can chat with us in the bottom right corner if you have any questions about what customs bonds are and how to use them. Once the bill of lading has been approved, the import must be classified in the Harmonized Tariff Schedule of the United States (HTSUS). This means that each container must be labeled with a special code unique that the specific item, so the CBP would be able to determine the value of the import and tax it appropriately. This code is typically 10 digits long. The first 6 digits are universal worldwide, while the last 4 are country specific. The code must correspond to a description you provide, but the process of finding the correct code can be difficult. The Harmonized Tariff section on the CBP website can help you figure out what the correct code is, and how to be sure that your code matches your description. When that is in order, the next thing an importer must do is submit an electronic cargo declaration, at least 24 hours before the cargo is loaded for shipment. Based on the information in these two documents, the CBP may decide to examine the cargo when it arrives at the port of entry. If your shipment does not meet the requirements, depending on the circumstances, it may be denied entry, seized, brought to compliance while in detention, re-exported, or even destroyed on the spot. After the import arrives at the port of entry, the importer will receive a notice, informing them of the arrival of their product. At the port of entry, the importer must submit additional documents within 10 days of the expected release date in order for the CBP to permit the release of the cargo. These documents would include the CBP form 7501, a commercial invoice, a packing list, a customs bond if applicable, and any special documentation. No more than 15 days after the arrival of the goods, the import must be filed with the Automated Commercial Environment (ACE) system. All importers are required to keep a record of all documentation for 5 years following the successful import of their products, for record-keeping and legal purposes. Once everything has been cleared with the CBP, information will be sent to the FDA for review. It might seem strange that the U.S. Food and Drug Administration (FDA) has anything to do with the import of electronics, but the FDA actually regulates much more than just food and drugs. Animal feed, alcohol, tobacco products, cosmetics, household wares, vaccines, and electronics all fall under the jurisdiction of the FDA. The FDA outlines a specific set of guidelines that must be abided by in order to import electronics, otherwise your import could be denied at the port of entry. Denial could result in your products being destroyed, so take extra caution when labeling and filing all required paperwork. All entries submitted through the CBP are heavily reviewed to make sure they are compliant with all FDA expectations and requirements. All electronics being imported must be properly labeled with the appropriate product codes. If the correct codes are unknown to you, the FDA offers a tutorial on their website to help determine the appropriate code. In addition to product codes, imports must also meet other labeling requirements. All products must be clearly labeled, in English, with a brief and concise description of the product. The country of origin and the recycling symbol, if applicable, must also be clearly marked on the products being imported, along with all certification, safety, and warning labels. Electronics specifically must be marked to affirm that they comply with all technical standards, which includes an certification or declaration from the FCC, and an optional additional quality certification from UL. All electronic imports must also be accompanied by required technical diagrams and risk assessments. The Federal Communications Commission (FCC) is a federal agency that is responsible for overseeing technological communication industries, like television, radio, and telephone. There are two ways that the FCC can register an electronic product: either with a Certification, or a Supplier’s Declaration of Conformity (SDoC). A Certification Procedure is the most rigorous approval process that can be applied to an electronic radio-frequency device. The device must contain a radio transmitting device in order to be evaluated using this criteria. Devices like this include remote control transmitters, land mobile radio transmitters, and wireless medical telemetry transmitters. An SDoC Procedure is used to determine whether the electronic product complies with the appropriate technical standards in place for devices like that. Electronics that fall under this category of classification include microwaves, computer peripherals, LED light bulbs, and television interface devices. If the electronic product does not compare to the baseline expectations of that given electronic type, it may be deemed as unreliable or unsafe. Products that qualify for the SDoC approval can also optionally pursue a certification. There are occasions in which both procedures could apply to a product, and this is becoming more common with the advancements of modern technology. Products that may be evaluated under both procedures include mobile phones, wireless local area networking equipment, notebook computers, tablet computers, and any other equipment featuring radio transmitters, like bluetooth capabilities, and digital circuitry. Importers must provide a test report to prove their product is in compliance with the FCC regulations in order to be deemed compliant. UL certification is non-mandatory, but is recommended to any importer wanting their electronic products to be perceived as high-quality and dependable. All electronics being imported for medical purposes require more documentation in order to clear customs. The establishment intent on using the imported electronics must be registered with the FDA prior to shipment. All medical devices being imported must be listed beforehand, including both variety and quantity. They are also expected to be manufactured in accordance with the quality systems regulation, to ensure consistency with their products and quality overall. A Premarket Notification must be sent to the FDA to prove that the device will perform safely and as expected. This requires comparing it to several similarly performing devices legally on the market already, to see if it is Substantially Equivalent (SE). Until the importer receives confirmation on whether the device is SE or not, they must not continue with the process of importing. If the device being imported is a Class III device, meaning that it has an inherently high risk associated with it, then importers will need to get Premarket Approval (PMA) before continuing. The device must be evaluated by the FDA to have significant scientific proof to insist that the device will operate as expected, and that the operation of the device is worth the risks associated with it. After a decision is made, the results are posted on the internet to show the data used in the decision-making, and for interested persons to petition a review of that decision. All medical devices being imported are subject to Mandatory Medical Device Reporting (MDR), which means that importers are required to provide information on incidents in which a certain medical device may have caused or contributed to a death or serious injury. It also means that importers need to report all cases of malfunctions by submitting an MDR event file for each instance of malfunction. All complaints are then forwarded to the manufacturer of the product. Medical devices must also be registered with Medical Device Tracking, which tracks the movement of certain medical devices as they move through the supply chain and over countries’ borders. Reports can be submitted by email, to the FDA’s Office of Regulatory Affairs or Division Recall Coordinator, or they can be submitted using the FDA’s electronic submission software. The FDA imposes extra regulations to protect the public from unnecessary exposure to radiation-emitting electronic products. Responsibility for regulating electronics fall into two different departments, depending on where in the production the product is being regulated. The Center for Devices and Radiological Health (CDRH) takes the general responsibility of regulating radiation-emitting electronics, and its primary goal to to regulate the production of those devices. State Regulatory Agencies take over after the electronics have been manufactured. These agencies regulate the use of these products, to ensure that the objects are being operated correctly, effectively, and safely. Several other government agencies are involved with the production and distribution of radiation-emitting electronics, including the Environmental Protection Agency (EPA), the Occupational Health and Safety Administration (OSHA), the National Institutes of Occupational Safety and Health, the Nuclear Regulatory Commission, and potentially others depending on the nature of the device being inspected. Do your research and make sure you are aware of any additional requirements involved with importing potentially harmful electronics. More information on importing radiation-emitting electronics can be found on the FDA’s website. So now you’ve done all the paperwork, paid all the expenses, dealt with finding a supplier and dealing with Customs regulations, and it should be smooth sailing from this point on. But what if the electronic you received are damaged or faulty? What should you do then? The first thing you should do if you are notified that your freight has been damaged is file a damage claim to the carrier you’re doing business with. Do this immediately, and don’t procrastinate in solving the problem. The window to submit a claim is 60 days, so you won’t want to waste time. Before you file the claim, make sure you have gathered the appropriate evidence, and have informed the correct people of the incident. Follow this checklist to make sure you cover everything. Have the original paperwork for the import on hand, including the Bill of Lading or Supplier contract. You will need to provide this as part of the claims process. Make detailed notes on the nature of the damages, and be sure to get photographs of the damage. Salvage any undamaged goods and keep them seperate from the damaged goods. Depending on the type of damage, this could prevent the damage from spreading to the other boxes. For example, if water got into the shipping containers somehow, you would want to remove the dry electronics from the wet ones, so they do not short circuit. Keep the damaged goods as evidence, along with all boxes and packing materials. Pay the freight invoice, even though the goods are damaged. You will need to provide evidence of this in order to file the claim, as it helps to determine the value of the goods and the cost of the damages. Inform everyone involved in the shipment, including your insurance carrier, the supplier, the freight company, and anyone else that may need to know about the situation. When you file the claim, you will need to include all photographs and paperwork outlined above, along with a detailed description of the product, the damages, and how the damages occured. Also make sure to send over any inspection reports received, and keep a record of all evidence and documentation until the claims process has been successfully completed. If the claim is not acknowledged within 30 days, if the claim is not paid in 120 days, or if you do not receive status reports every 60 days, you should reach out to the carrier’s headquarters to inform them of those violations, and you will need the original documentation as proof. If completing all the required paperwork for the CBP, FDA, and FCC, considering additional requirements, and handling freight claims seems daunting, there is a solution for taking the stress out of your hands. Employing a licensed customs broker and giving them the power of attorney to handle your shipments can make the process simple. Your broker would be a professional that’s familiar with the import process from start to finish, and can ensure that everything goes off without a hitch. They deal with clearing customs on a daily basis, and are reliable experts that you can trust with getting you shipment to you in the most efficient way possible. In the event that your freight gets damaged or goes missing, customs brokers will take care of all the requirements to get your imports back on track, and to make sure your business doesn’t suffer. In order to enlist the help of a licensed customs broker, you will need to set up a customs broker account. You will need to complete a general account application, a general account questionnaire, and make an account profile. From your profile, you will be able to complete the required power of attorney and import security documents. USA Customs Clearance can make the import process easier on you. Our value-added customs brokerage services can assist you in getting your imports through any American port of entry with ease. If you have any questions, or you’d like to get started, just click the chat on the bottom right side of the screen to instantly connect with one of our representatives. I do not have the license and I want to recover the goods, how can I resolve this situation? Thank you for reaching out! One of our customs brokers will be in touch soon via email.